Timothy D. Elliott and Emily A. Shupe of Rathje & Woodward, LLC have been selected as 2016 Illinois Super Lawyers. The law firm of Rathje & Woodward, LLC, is proud to announce that Attorneys Emily A. Shupe and Timothy D. Elliott have been selected as 2016 Super Lawyers in the state of Illinois. Elliott has been recognized for his professional achievement in the practice area of general litigation. This is his fourth straight Super Lawyers recognition since 2013, and he was named a Super Lawyers Rising Star from 2008-2011. Shupe has been named a Super Lawyers Rising Star since 2014. Her recognition comes from her outstanding work in the area of general litigation. The law firm of Rathje & Woodward, LLC was founded in 1938. 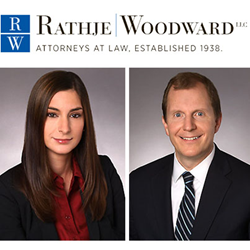 As one of the oldest and most well respected law firms in the area, Rathje & Woodward has played a significant role in the Chicagoland legal and business community. The firm is dedicated to providing top quality legal services to businesses and individuals throughout the Chicago area and nationwide. Most recently, the firm expanded to Wisconsin with the opening of an office in Madison. Rathje & Woodward handles legal matters in relation to commercial transactions, employment law, business and corporate law, general counsel, tax law, intellectual property, real estate, insurance recovery, municipal law, estate planning, and criminal defense. For more information about Rathje & Woodward or to discuss your legal needs with an attorney call 630-668-8500 or fill out the online contact form.